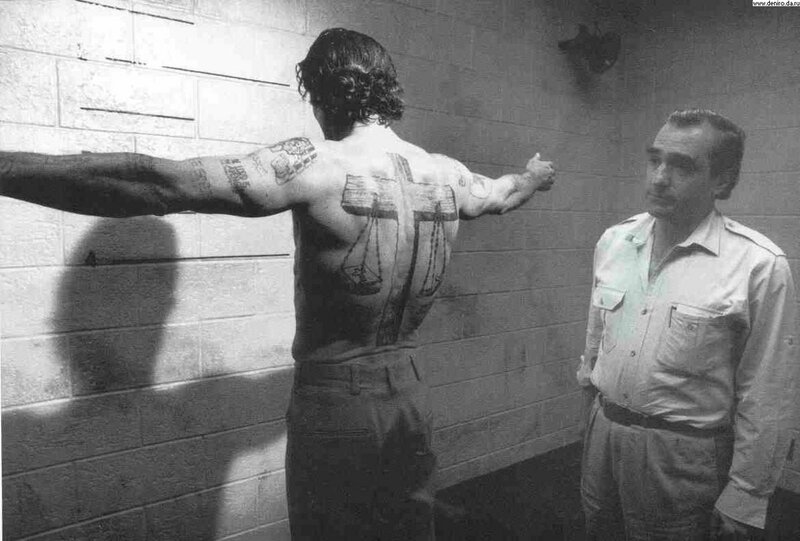 DeNiro's character, convict-out-for-revenge Max Cady, was covered in tattoos, many of which taken from Biblical imagery. Scales of justice were rendered as a cross-themed full-back tattoo with multiple Bible quote tattoos on the chest and arms. Doesn't the Bible Forbid Tattoos? In the Leviticus section of the Bible, you will find a passage that sometimes says something about not making marks on the flesh, and sometimes outright says "no tattooing." It will depend on the modernity of the translation. However the idea is pretty much the same, and it's a seriously debated point amongst those who are strongly religious. 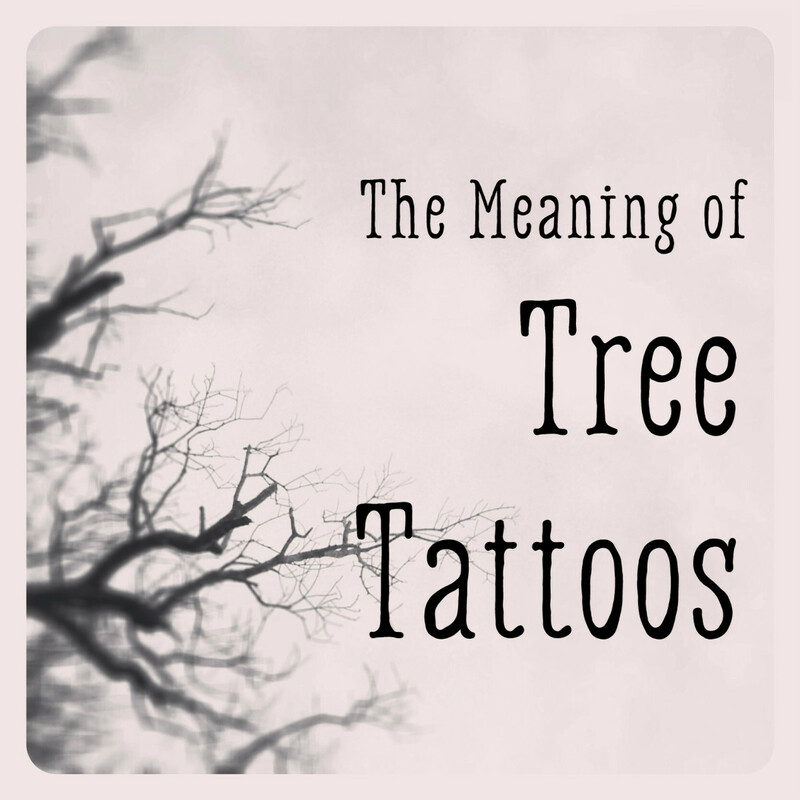 However, in the world of tattooing, there is a very strong presence of Christian symbolism and designs and it seems to have always been a part of Western culture. Portraits of Jesus and Mary abound, as do renderings of the Last Supper, backpieces of the Rock of Ages, and more. Crosses, in endless variation, are one of the most popular tattoo designs presently. 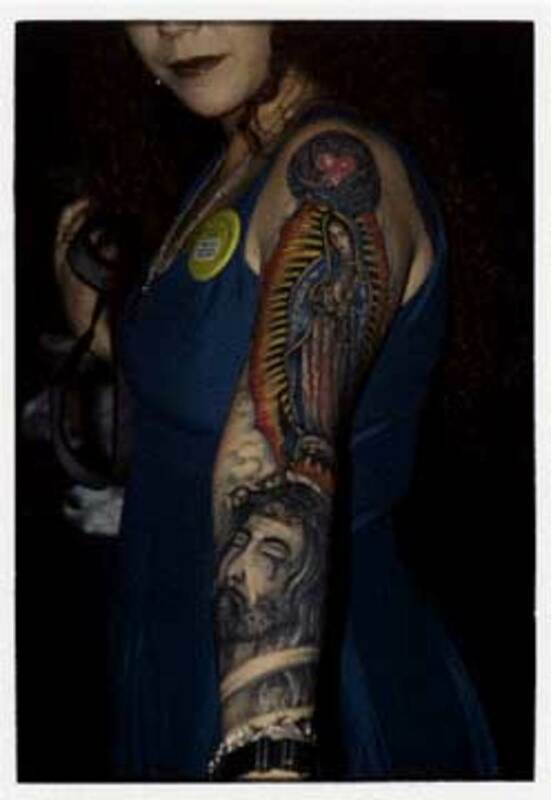 A wide-range of modern Christians now feel that the passage in the Bible speaks only to emblems not of their own faith, and take no shame in wearing skin art that illustrates their beliefs. Some people feel the imagery is a constant reminder of the divine and makes them feel closer to God. Others have gotten religious tattoos as symbols of healing or re-birth. Angels - Tattooed angels range from cute little cherubs up to elaborate renditions of Seraphim. Cross - supposedly way back in the Crusades, Christian knights had little crosses tattooed on their hands so that if they fell in battle, their wish for a Christian burial would be known. Whether large or small, ornate or plain, on public view or hidden, a cross emblem is probably the most popular Christian tattoo. Portraits - Many people commission their tattooist to do a portrait of Jesus, Mary or their patron saint. Portraits can cause a bit of a stir when people have themselves or loved ones depicted in the form of a famous religious portrait. Religious scenes - These can be renditions of Bible scenes or reproductions of famous paintings that are Bible-oriented. One extremely popular tattoo image isn't from the Bible at all: it's the Rock of Ages, showing a woman clinging to a rock in the midst of stormy seas. Quotes and scripture - Some people have Biblical passages tattooed on them, and others just have the book and chapter numbers tattooed. 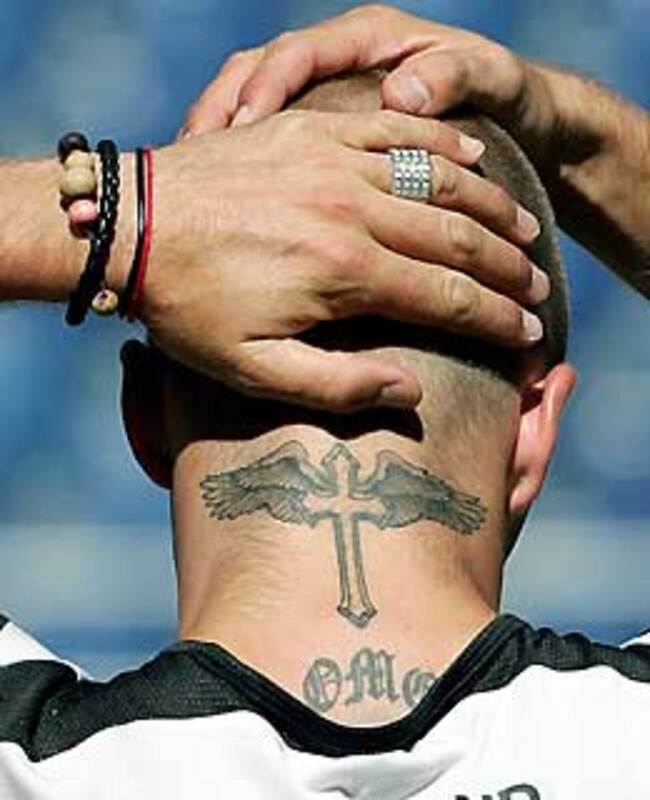 The winged cross on the neck of soccer star David Beckham. 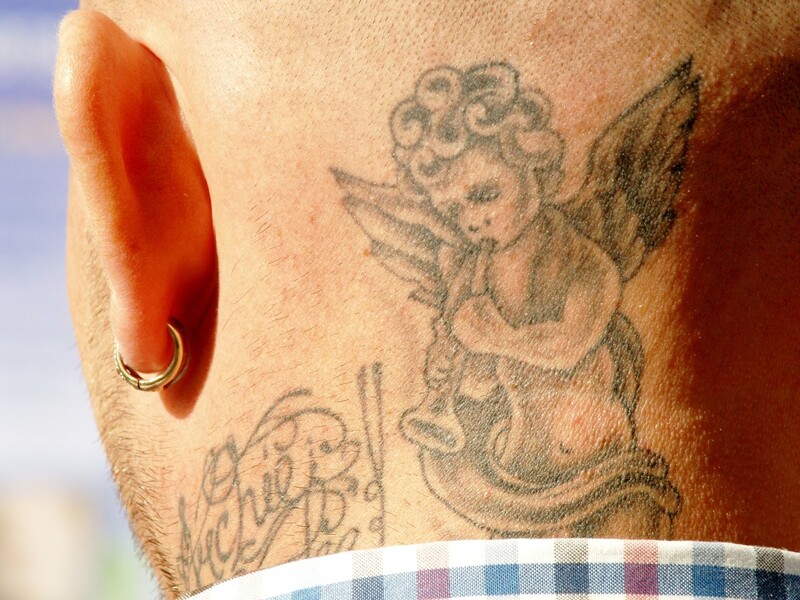 His back is tattooed with a large cross and his right upper arm has a large tattoo of an angel on it. 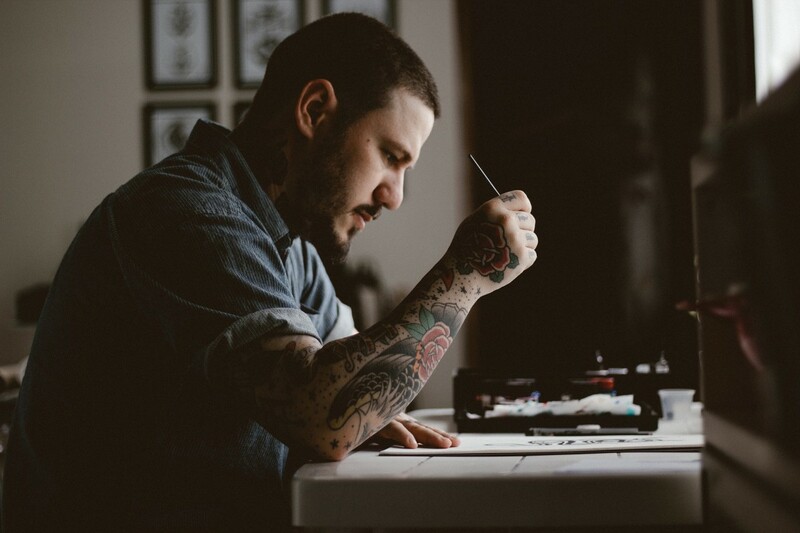 Yes, Christians do get tattoos - and for many of them, Christian tattoos represent a unique and personal way of keeping Christian iconography and religious imagery close at hand. 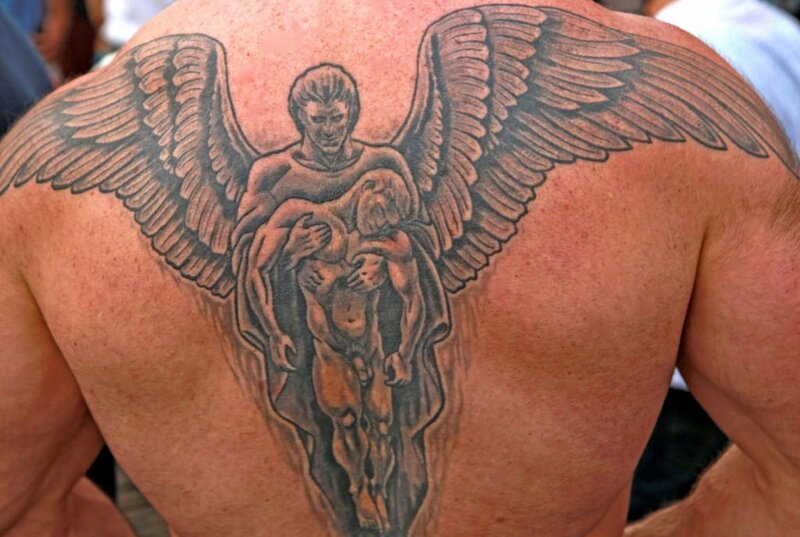 Does the Bible teach that God forbids tattoos and other cosmetic body modifications? 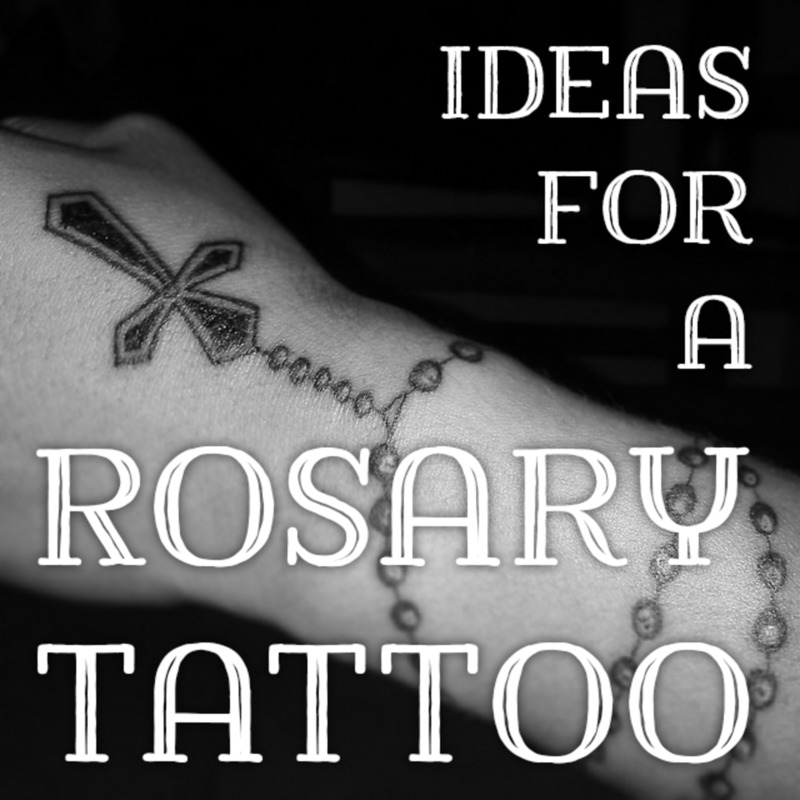 Biblebell- should Christians get a tattoo? What do you think about Christian tattoos? What an inspirational hub...I have never had a tattoo, but nearly came close once. Both of my children have one and enjoy them. Christians are becoming more outspoken in advertising their faith. Tattoos are just another step towards that. Strangely enough, no one mentioned the Revelations 19:16, which mentions Jesus having a tattoo on his thigh. I'm not advocating that this means we should all go get tattoos, but you have to recognize context. Also in the Levitical account (a couple verses before), it says not to clip your beard or the hair on the side of your head, to not eat fruit from a tree until the fourth year after it was planted, to not mix different materials in your clothing, and to not plant two types of seed in a field. Understanding the full revelation of God doesn't mean ignoring the Old Testament, but seeing it for what it is: an unbearable burden that is fulfilled in Christ and therefore through us through Christ. That may not shed much light on anything, but that's all I've got right now. Well, elimentree, there are not only different translations and wordings found in various Bibles, but I've met Christians who interpret the meanings differently. Luckily, I'm of a different faith and don't have to worry about such things. Relache, the bible is very specific and direct in its position against marking the body. The bible specifies that believers are not to do this and other things like shaving or cutting parts of the body to mourn the dead. The bible also says that Gods people are 'peculiar' and are NOT to conduct themselves as the rest of the world. The second of the ten commandments states that we should .."not make any likeness of that which is in heaven above, or that is in the earth beneath, or that is in the water under the earth." Such likeness would cover tattooing of all images, even biblical ones. Religious tattoos have unique significance all the time. It is believed to have purity in life by inking the religious tattoos on different parts of the body. you are a great writer, have a lot of friends with tattoos, expressing their love for God. Awesome comments, i love tattoo too. In Russia, we have some other interests about tattoo, but the most popular: sharks, tigers, dragons, tribal and of course some phrases or your own name. I am approaching 50, and about to get my first tattoo. 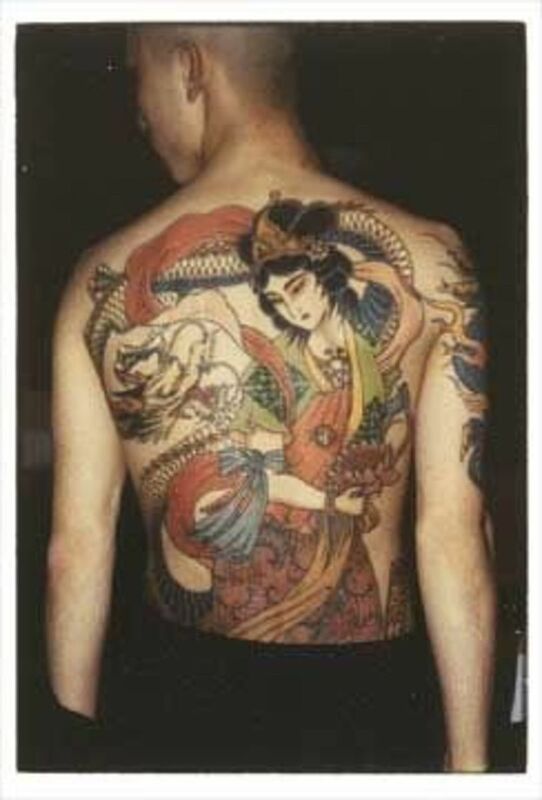 I have long admired tattoos, but had been brought up being told they were sinful. After nearly 50 years, I finally no longer care what other people think and am about to do this for myself. It will be a daily reminder to me of how much my God does for me, and how I need to live for Him. As a female, a mother and a person who has a cross tattoo, I know why I have mine and it is as a daily reminder of my relationship with God. It is to remind me to do as much as I can for Him because he certainly has and does do so much for me. I'm so glad this hub has gotten so many positive comments! I am a young adult female, very passionate Christian, who had wanted a tattoo for as long as I could remember. So when I got one when I was 21 years old, I LOVED it! And I still do! My tattoo is a lower-back tattoo of the Christian fish (icthus) with flowers and vines around it. My parents don't understand it, but I know of many young Christians who are tattooed, mostly with religious symbols. I also think that we shouldn't try &amp; cause people to stumble or question their beliefs, but we also have the freedom to praise God as Christians with tattoos, if that's what we choose. God has given us brains and differences of opinions, so if tattoos aren't for you; then that's totally fine. But lots of Christians believe them to be perfectly okay, as do I! I believe that God gave us all a canvass to live with and he gave us all the choice to do with it as we will. So, one can either go through life with a blank canvass or go through life decorated. And, it's a personal choice. My tattoos are a witness to others of what I believe in. I'm a girl with a lot of tattoos and people cannot believe I'm a Christian but I sure am! Why shouldn't we be able to paint our bodies as a Sign of love to The Lord while others can paint paintings as a sign of their love? relache, that's exactly right! I'll have to ask a Hebrew professors I know about the original language. I can't remember what I read about it long ago - seems that the word meant something like 'tribal marking cut into the skin&quot;, but I I could be wrong. Anyway, peoplE with the Christian tattoos here look like living stained glass to me - AMAZING! What a lot of people don't realize is that the word &quot;tattoo&quot; didn't come into the English language until the Europeans discovered Tahiti and their word &quot;tatu&quot; so whatever was really said in the OT was something different and the use of tattoo there is just a modern translation. In the New Testament, Paul says that Christians can do anything at all, but should be prudent in choices that might lead others to harm. So, I think from there it is a matter of personal judgment/choice. While I don't care for tattoos myself, I respect a couple of people in the shop on Miami Ink VERY much, because they are professional and take their work seriously as an art and a service to people that will help them memorialize loved ones and events. 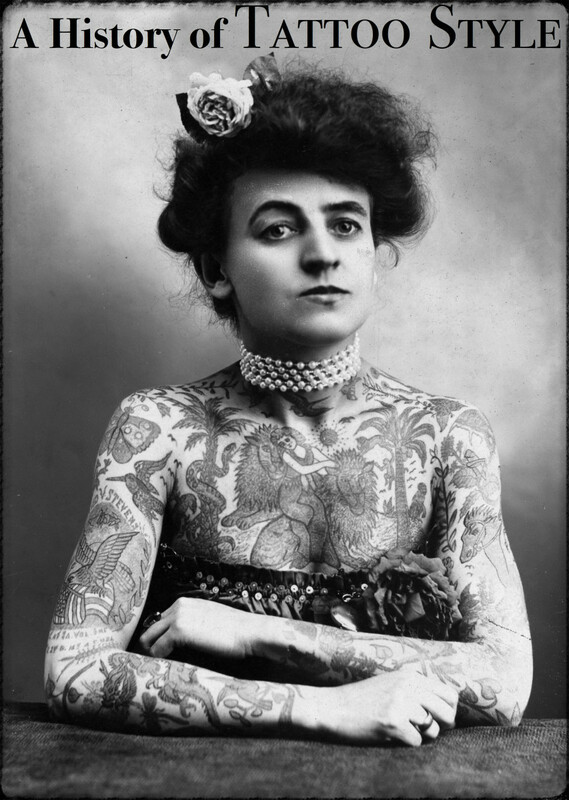 (In the Old Testament, Leviticus 19:28 says, 'Do not cut your bodies for the dead or put tattoo marks on yourselves.I am the Lord.&quot; -- tatoos were made for superstituous beliefs at someone's death to frighten away evil spirits. God said that was not necessary, to have those superstitions any more.) Nice HUB! From now on let no one couse me trouble, for I bear on my body the mark of Christ Jesus. 18 The grace of our Lord Jesus Chist be with your Spirit. Christian Tatooing. I would have never guessed. anything one does to there body could be considered descration. tattoo&#39;s dont change peoples beliefs or make you a better or worse person. its a form of art that people should and can enjoy!